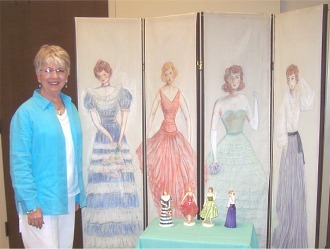 Linda Vickers, artist, standing with her screen painting depicting GFWC centennial porcelain dolls. Created in the 1980's, the screen has been carefully preserved by club member Alberta Bonebrake. The Collinsville Home Representative Club met May 5 at the Community Church for their final meeting of the club year, which included plans for the October brunch to promote breast cancer awareness; a donation to Newborns In Need, the exchange of Secret Sister revealing gifts, and a look back in the Club's history regarding the infamous "window committee," and the many successful years of the Patriotism Contest for 3rd, 4th, and 5th graders. Those in attendance were: Susan Pratt, Pat Anderson, Carolyn Brinkley, Marsha Nachtigall, Helen Murphy, Joyce Baker, Bobbie Loveless, Margaret Waldorf, Kitty Thomas, Linda Pfeffer, Linda Vickers, Barbara Colpitt, Rusti Howard, Jeanie Barnes, Alberta Bonebrake, Krista Nall, EvaJo Sheehan, and Laura Maul. 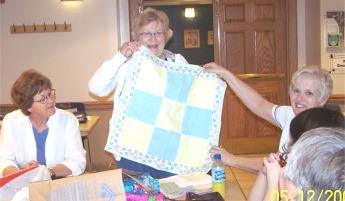 Frances Ashinhurst shows off one of the baby blankets she's made, with the help of Chris Pierce (left), and Sherry Neph (right). The Collinsville Patchworkers met May 12 at the Library, and President Rosie Vaught displayed her collection of batik fabrics purchased in Singapore. Kay Pritchett and JoAnn Woods shared Patriotic fabric postcards for our fighting troops, members discussed quilting tips, and Peggy Peterson won the fat quarter drawing. The next meeting will be June 9 at the Library. Forgiven Quartet will sing at Collinsville Community Church at 7:00 PM on Saturday June 27. Admission is free, and everyone is invited. Forgiven Quartet has performed all across Middle America since 1981 with an emphasis on the smooth harmonies of southern gospel music. They have appeared in concert with many of the top names in gospel music, and they have released nine gospel recordings. The Collinsville Library is sponsoring a photography contest as part of its Teen Summer Reading Program, "Express Yourself @Your Library. Students in 6th grade and up can enter one picture in each of three catagories: People, Places and Pets. Winners will receive gift cards. Entries can be emailed to myphoto@tulsalibrary.org or submitted at the library; please be sure to include the name and phone number of the photographer. Come by the library or check our website for more summer activities for teens. Calling all little ladies. Please mark your calendars for June 6th and join us at the Collinsville Library for a Princess Tea Party. The festivities will be from 10am - 11:30am. We will have story time, crafts and delectables as well as tea and punch. This event is for young ladies, age 10 and under and a caregiver. Seating is limited - please R.S.V.P. 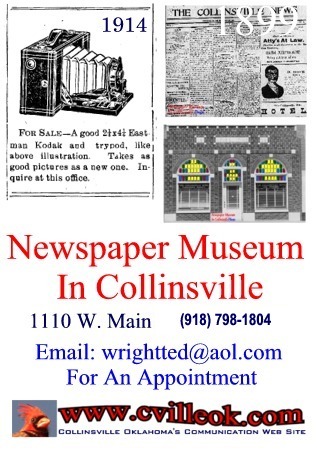 to the Collinsville Public Library at 596-2840 to reserve your spot.